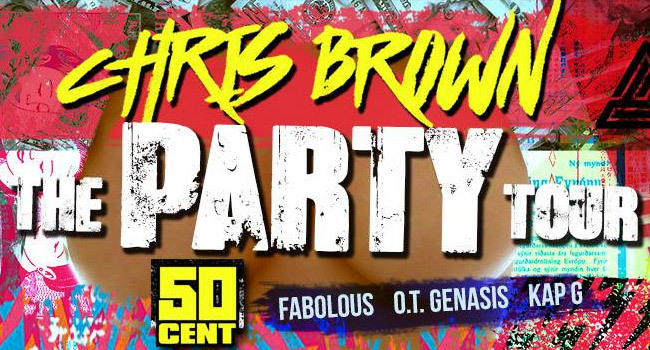 Celebrating some of the biggest names in music today, Grammy Award-winning and multi-platinum-selling, singer-songwriter, Chris Brown, along with his special guest, award-winning, multi-platinum, record-breaking artist 50 Cent, bring the Party to cities across North America this summer with The Party Tour. Produced by Live Nation, The Party Tour features Fabolous,O.T. Genasis, and Kap G for 33 nights of soul-baring performances, and an all-star set for a more than two hour powerhouse show each night. Brown kicks off the party as his friends join him throughout the night – the party begins when the show begins! Fans are urged to get there on time each night to be part of this historical movement! The anthem of the night was teased in Brown’s current single “Party” ft. Gucci Mane, Usher. The Party Tour begins a seven-week run on Friday, March 31st in Baltimore, with stops in Boston, Detroit, New Orleans, Miami, Philadelphia, Brooklyn, Atlanta, Phoenix, Las Vegas and more, culminating on Tuesday, May 23rd in Los Angeles. The Party Tour will launch an exclusive fan club pre-sale beginning Wednesday, February 22nd at 10 am local time, through Friday, February 24th at 10 pm. Exclusive VIP packages available at VIPnation.com. General on sale begins Saturday, February 25th at 10 am local time through Ticketmaster. A Citi cardmember pre-sale begins Wednesday, February 22nd at 12 pm local time through Citi’s Private Pass Program.